As you may know, we live in the top floor of a condo building- our patio is small, a little cramped, and probably 35 sq feet... but that is no excuse for us not to have a garden. Our tulips started emerging in mid-March, and we began to add a few more plants, and slowly I started noticing our neighbors began to also invest in their porch gardens. Trendsetters? I think so! But, I know many people who would love to have the access to a garden and planted vegetables, but scoff at the notion of having potted plants. It's not for lack of space, but due to, I believe, a lack of gardening knowledge. Many feel that they possess a black thumb, and can't keep anything alive. But, I think that with a little know-how, anyone can experience gardening success. -Start with a bit of a plan. Locate where the containers will reside, understand where the light direction comes from, and position accordingly. -See that little tag attached to the plant at the nursery? Read it- it actually means something! It will give you an idea of how big of a container you'll need, how often you'll have to water, and will let you know if you have the proper lighting conditions so the plant will thrive. -Not all containers are the same. For example, terra-cotta pots dry out quicker than others (meaning- more watering). Alternatively, there are pots made of fibreglass that are lightweight and hold water a bit better (these pots typically are made to look like stone or concrete).Keep in mind the plant's optimum growth size. It may look like a little sapling right now... but it wob't stay small for long. -Purchase some potting soil. Yes, the plant does come with a bit of soil from the store- but potting soil gives you the proper nutiritional foundation your plants need to thrive (and survive). -I just learned this one recently: If you choose terra-cotta pots, soak them before adding soil- it'll keep the roots more moist and allow them to cling to the soil better after the transporting them. -When it's time to plant, will the container 3/4 full of soil, adding a bit of fertilizer in, and working it into the soil as you go. Take the plant out of the container, loosen the roots up a bit (don't massacre it!) and place in the container. Add some more soil to fill the pot, leaving an inch or so from the top edge of the pot (this will give some space for water to accumulate when watering). -Water the plant (often). This is why plants die- gardens are neglected and wilt in the hot sun. When watering, keep doing so until you see some water leaking out of the pot's drainage holes. If this sounds like too much trouble for you, consider self-watering containers. 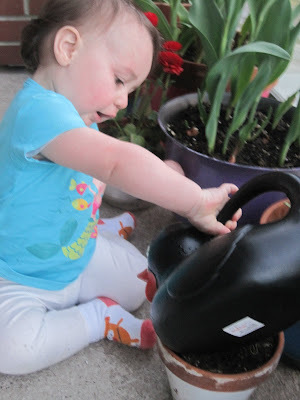 Gardening is so easy- even a child can do it! -While you're at the nursery, consider splurging another 5 bucks on some fertilizer. Miracle-Gro has these individual one-time-use packets. Empty the contents into a watering can, add water, and feed (you only need to fertilize every 2 weeks). That's it! Fertilizer establishes strong roots in your plants- resulting in bigger blooms! -And finally, properly prepare your containers for the cold winter months- either move the pots indoors, or move them to a sheltered location and cover them with burlap. Taking care of plants can seem intimidating, but with a bit of patience and perserverance, you can have a beautiful garden display.